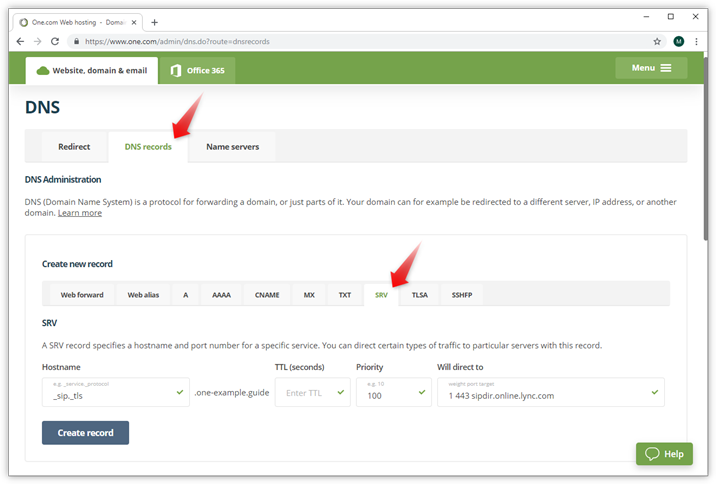 With an SRV (Server) record you can specify a host and a port for specific services, like for example Lync/Skype for business with Office 365. In most cases, a third party service will tell you what the record should contain. When you need to enter the value or the location where you want to direct to, it will typically consist of a port weight and target. Looking something like this: 1 443 sipdir.online.lync.com. Under create new record, click SRV. - Enter a hostname, the field can't be empty and can't contain spaces. - Enter a priority, normally 10, 20, etc. The lower the number, the higher the priority. - Enter the value (weight port and target) or server you want to direct to. Example: In the screenshot below we are creating an SRV record to be able to use Skype for business.